Adolf Hitler and Joseph Stalin were equally blamed for setting off World War II by Ukrainian President Petro Poroshenko on Thursday. Both the Nazi and Soviet leaders were behind the “massacre,” aiming at “splitting Europe,” Poroshenko lectured. 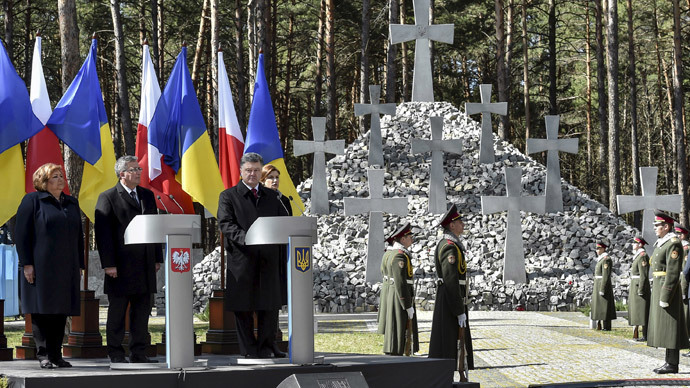 “Hitler together with Stalin initiated the bloody fighting of World War II, and then tried to divide and split Europe,” Poroshenko said during a ceremony at a Bykivnia Graves memorial near Kiev. The ceremony at the historic memorial was attended by the president with his Polish counterpart Bronislaw Komorowski, with the two leaders honoring the victims of totalitarianism at the mass grave site. Poroshenko’s speech was delivered on the same day as Ukraine’s parliament, the Verkhovna Rada, passed a bill that equates communism to Nazism by banning both regimes and all their attributes in Ukraine. No Soviet symbols and attributes must be used while remembering the victims of the war, the bill says. “It’s time to get rid of Soviet cliches,” head of Ukrainian Institute of National Memory Vladimir Vyatrovich announced in the parliament. Another bill, passed by MPs on Thursday, celebrates Ukrainian 20th-century nationalists as ‘freedom fighters’. Members of the Organization of Ukrainian Nationalists (OUN) and Ukrainian Insurgent Army (UPA), who operated from 1917 till 1991, are proclaimed to have been fighting “for the country’s independence,” and will be granted social benefits. Both OUN and UPA have been previously linked to Nazi Germany, fighting against the Soviets, as well as the Poles. According to some estimates, members of the two organizations killed almost a million people, with thousands of Poles among them. On Thursday, the Polish president expressed hopes that relations between the two nations will not be affected by the past. “I hope that current good relations between our states and people will not be negatively affected by former disputes and conflicts,” Komorowski said when addressing the Rada, adding that “memories of the victims of fratricidal crimes, worthy respect of all the victims in the places of their sufferings and death” is both Poland’s and Ukraine’s duty. Commenting on Poroshenko’s claims and the new Rada laws, the Kremlin said that such news could only bring tears to the eyes of war veterans. “The memory of that war will be cherished in Russia, and lessons that it gave to the whole mankind will be remembered,” spokesman Dmitry Peskov told journalists. Peskov added that he feels sorry for the Ukrainian statements, particularly as they are made ahead of the 70th anniversary of the end of WWII. Among the new laws passed by Ukrainian lawmakers on Thursday was a bill suggesting to no longer use the term ‘Great Patriotic War’ (as WWII is commonly referred to in Russia and former Soviet republics), but rather stick to Western title World War II. The Soviet Union lost 27 million people – over half of them being civilians – during the war, constituting the biggest death toll among other members of the coalition fighting against Nazi Germany.